Look I am glad the Queen said it too because I thought the whole display looked creepy. The Queen as someone has already put it so beautifully is a "cool customer" and so if she thought that then it's okay with me. The whole display appears to be in honour of someone who has died instead of a newly married young woman .... the Queen called it in one. I wonder if she has a view on who will win the world cup in September. I think the Queen- joking or not- was correct in her assessment of the display. I'm sure it's too late for it to be changed, but perhaps the museum will put more light or make it look 'livelier'. As a lot of people have mentioned, it does look as it's honouring someone who has passed away- with the headlessness and dark lighting (from the photos I've seen). I decided I've lurked long enough and wanted to jump in and join the discussion with my initial post. 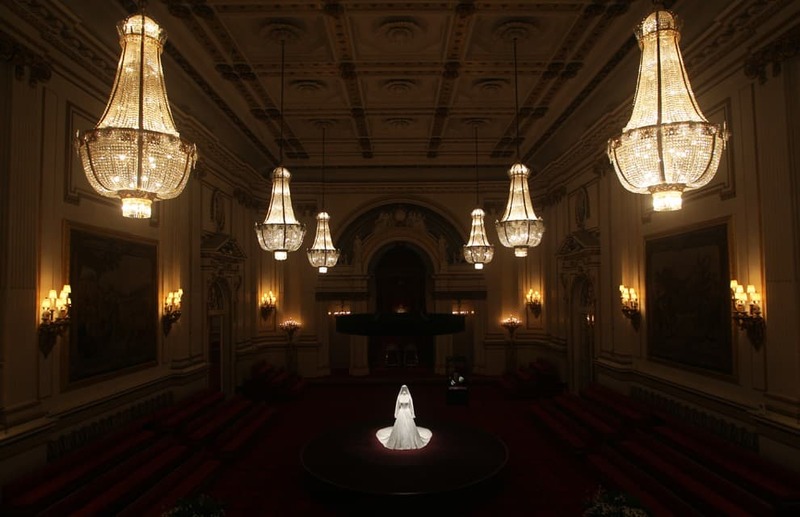 The display is very eerie and the gown looks lost in the vastness of the room. It looks like an homage to Miss Havisham in "Great Expectations." I also find the lighting very odd on the bodice of the gown; it throws shadows on the bustline in a not very flattering way. Perhaps a small spotlight at the base might dispel these shadows. Maybe the curator will take the Queen's resounding opinion to heart and modify the display. Thank you to all members who have made this forum such a scintillating site. Your lively discussions and great expertise are the cause for much of my time spent here. Who is responsible for the care of the palace? Do the funds come from the royals or the public..or both? IIRC, the money for the 'public' residences of the monarch and the BRF [BP, Windsor, KP, SJP etc] comes directly from the taxpayer in the form of 'Grant-in-Aid' as it is known and not out of the Civil List payment made to the Queen. The problem though, as I understand it, that the sums paid have been cut back over the years in an attempt to save money, which means that routine and planned expenditure on maintenance has often been scaled back... After the fire at Windsor Castle in 1992, BP was opened to paying visitors [it had never been opened before] and parts of Windsor Castle previously free or off-limits were also opened. The originally intention was two-fold: one, to provide the necessary funds to restore the fire-damaged Windsor without calling on money directly from the taxpayer and secondly to allow people, albeit for a price, to see something more of the Palaces. Members here might well remember that at that time [the famous 'annus horribilis'], there was a general feeling that the RF was becoming remote and there were also complaints about the cost of the monarchy. IMVHO, I think that the period was unfortunate, because people were still getting over the death of Diana, which some people perceived as having been handled insensitively by the monarch, and also a general disenchantment with the activities of Sarah, Duchess of York, whose particular antics at the time were being used [fairly or unfairly] as a sort of 'stick with which to beat the monarch' After Windsor was repaired, the charges still remained in force and I understand the money is used to help maintain the Royal Palaces. Balmoral and Sandringham are the Monarch's own properties and their care and repair is a matter for the Queen's own purse. I am sure that more experienced members of TRF will be able to better supplement this information. IIRC, the money for the 'public' residences of the monarch and the BRF [BP, Windsor, KP, SJP etc] comes directly from the taxpayer in the form of 'Grant-in-Aid' as it is known and not out of the Civil List payment made to the Queen. The problem though, as I understand it, that the sums paid have been cut back over the years in an attempt to save money, which means that routine and planned expenditure on maintenance has often been scaled back... After the fire at Windsor Castle in 2002, BP was opened to paying visitors [it had never been opened before] and parts of Windsor Castle previously free or off-limits were also opened. The originally intention was two-fold: one, to provide the necessary funds to restore the fire-damaged Windsor without calling on money directly from the taxpayer and secondly to allow people, albeit for a price, to see something more of the Palaces. Members here might well remember that at that time [the famous 'annus horribilis'], there was a general feeling that the RF was becoming remote and there were also complaints about the cost of the monarchy. IMVHO, I think that the period was unfortunate, because people were still getting over the death of Diana, which some people perceived as having been handled insensitively by the monarch, and also a general disenchantment with the activities of Sarah, Duchess of York, whose particular antics at the time were being used [fairly or unfairly] as a sort of 'stick with which to beat the monarch' After Windsor was repaired, the charges still remained in force and I understand the money is used to help maintain the Royal Palaces. I wasn't aware that there were two fires at Windsor Castle. I've only read/heard about the one in 1992. The question if the Faberge pieces are still being made how about getting some information beforehand or think logically for once. And I don't see how either comment suggested an inability to think logically. The BBC video captured the Faberge conversation - wish they would have shown some of the pieces that the Queen and Duchess where viewing, beautiful, I'm sure. it appears she's talking about an incident where something fell off. Sorry Daria_S, you are right, it was my sloppy typing. The 2002 Fire was at BP, when initially posting, I had added a phrase about the 2002 BP fire, then deleted it, except the date. Which made it look like there were two fires at Windsor. I wonder how the first day of the exhibition went. I saw on french television yesterday evening a report from channel 2 (France is becoming obsess with the BRF more than the monaco's one, it's strange). The video is very clear. Here is nearly the conversation. Kate begins. "It's surrealist to see the dress without the head". The queen answers back laughing, "You mean it's horrid'. And then they laughed together. Kate was not nervous at all in presence of the Queen. The camera follows both when they enter the ball room, and Kate was relaxed, but not too much. She exactly knows her place, and have great dignity, she walks just a small step behind the queen, but a very small step. She spoke with the curator too and explained something - inaudible - to the Queen, the queen was listening quite attentivly kate. Perhaps it is somewhere in this thread, is the cost of the wedding dress a public figure? The fruit of the spirit is love, joy, peace, patience, kindness, goodness, faithfulness, gentleness, . . . . I was watching the BBC clip and had to chuckle because almost after the Queen gave her opinion of the display, she folded her arms and looked first at the male curator and then at the female curator. The poor lady gave what appeared to be a nervous smile and bobbed a fast curtsey, perhaps thinking that HM might take her displeasure out on her! Also, another poster had remarked that Catherine was saying something about purple but it was unclear. I think she said that the dress looks fine and with the purple there as well. Could the Queen have been talking about her own wedding day when her pearl necklace broke? I remember the story that this happened and it had to be quickly repaired. She was talking about a catch, which she didn't notice, and how the whole thing went "bluh," gesturing with her hands as if the necklace fell off. That's the only thing I could think of. So I can imagine that when the Queen saw this headless mannequin wearing a tiara, it did look a bit unusual compared to previous displays from the royal collection. And I'm glad she spoke her mind to the curators. I would also wonder why anyone would put out a replica of something when the original is available? In this case, the curator (or whoever this guy was) should have just trusted his monarch's assessment/answer. It's her collection after all. I don't think anything is being made by Faberge, unless of course his children/grandchildren inherited his talent and set up some sort of business. Alex, thank you very much for this information. I'm glad you were not hurt during the Investiture ceremony, though I'm sure you would have accepted any injury as an honour.... LOL. No, earnestly, I have a question. I once read that the Prime Minister has a country seat, Chequers? How well repaired is this building? And how much does "the taxpayer" - via "the government" - spent on this upkeeping? Thanks! I wasn't quite sure what Kate said in the beginning of the conversation. Faberge items are still being produced by the family. His great-grandaughters design some of the pieces. They make some beautiful Faberge egg pendants. FABERGÉ. Welcome to the World of Fabergé. As for putting out replicas, the original pieces are rare and and way too expensive to buy (recently one of the eggs sold for 9.5 million US dollars). So if you love Faberge pieces and don't have millions lying around, the replicas allow you to buy them for cheap.